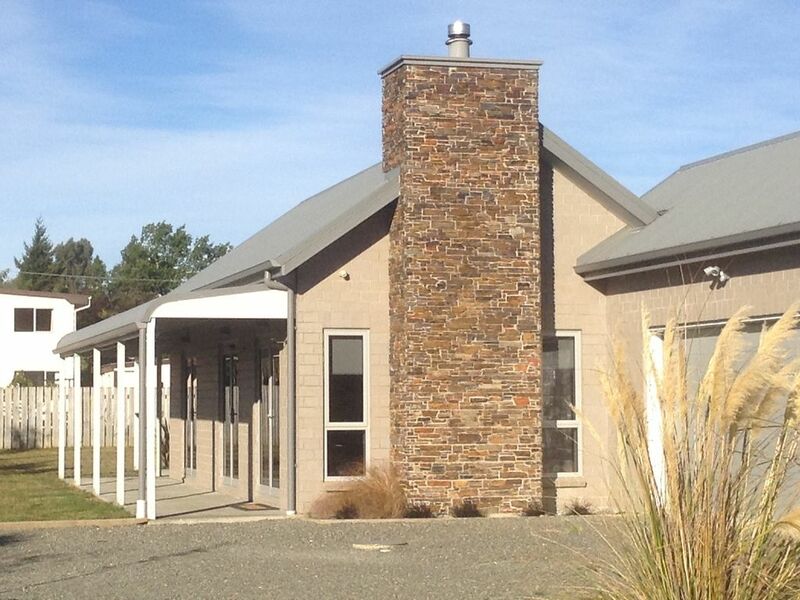 Manapouri Lodge-set in a quiet location. Immaculate in every way. Manapouri Lodge is a premium, contemporary, well appointed three bedroom, two bathroom home situated directly above the Doubtful Sound departure point. A very new house set in an amazingly quiet location yet in the midst of some of the most wonderful countryside that New Zealand has to offer. The open plan sitting/dining/kitchen offers warm family focused living all with comfortable seating. Spacious with views to Fiordland's mountains. Complimentary WIFI, Digital tv, dvd, stereo and a log burner with fuel supplied. The kitchen is fully appointed offering plenty of utensils for baking, cooking and serving, with a skylight to enhance the brightness of this super marble benchtop work space. All bedrooms have wardrobes, side tables, bed lamps, drawers and opening windows. The King and Queen rooms both have opening doors to the verandah and mountain views. The King bedroom has an ensuite with shower, vanity, toilet, opening window and heater. Beds are lush and comfortable with complimentary fresh ironed linen and warm duvets with plenty of extra bedding if required. No electric blankets. Manapouri Lodge is that bit extra, a home exuding warmth, comfort and style. Family friendly include many toys and games, a high chair and portacot. Fenced on two sides and situated in a quiet cul-de-sac. Manapouri Lodge has its unique character creating a real home feel that is happily shared so you may truly relax and make Manapouri your home base for the duration of your Fiordland venture. Kia Ora and Welcome to Manapouri Lodge. I am a long time Manapouri local, happily working within Fiordland tourism, for my years in the area, in roles such as hosting on the now decommissioned 99 year old vessel Tawera, taking freedom walkers and stores across Lake Te Anau to the beginning of the Milford Track. I am familiar with the Fiordland Gems Doubtful Sound and Milford Sound - spending many evenings at both Sounds- and am more than happy to recommend cruises and activities that will fit best with your group's needs. Manapouri Lodge is tended to a high standard with all linen laundered at the home. Manapouri Lodge is a real home, happily shared so you may truly relax and make Manapouri your base for the duration of your Fiordland adventure. May you enjoy this super home. Manapouri Lodge is set in a family friendly newly developing cul de sac. Across the road, is a car park and off the car park a walkway to the Doubtful Sound departure point. Continuing from the Departure Point is a beautiful bush track to the lakefront. toilet, shower, All bathroom essentials provided. Extremely clean. toilet, shower, Vanity and shower. Separate toilet. Opening window. Heater. Manapouri is a sweet friendly beautiful village nestled on the shores of Lake Manapouri and the Waiau River. Complimentary fresh quality linen laundered at Manapouri Lodge. Off road parking. Plenty of room for boats and cars. Complimentary wifi. Password at house. Complimentary fresh quality towels laundered at Manapouri Lodge. Comfortable, warm with plenty of seating options. Plenty of everything you'll need. Open kitchen-dining. Table extends to comfortably seat up to six. Table mats and coasters. Nice bach which is well set up. Nice bach which is well set up. Would give 5 stars if it wasn't so over looked by other houses. The house was lovely and well maintained. The house was lovely and well maintained. Very modern. Warm and cozy. Made our stay very enjoyable. We had half a day where there were thunderstorms so we had to head back home and just enjoy the very nice house. Would definitely stay here again. Highly recommended. This property is new and that is reflected in the decoration. This property is new and that is reflected in the decoration. It is beautifully furnished and the house is very clean. The kitchen provides everything you could need and there is also a laundry for guests to use. Unfortunately the street wasn't on the map I picked up from the iSite (probably because it is new) but the helpful lady in the iSite was able to look it up on her computer, so didn't delay us by more than a few minutes. Our second stay at this lovely house - which has every possible amenity for a wonderful holiday. Doubtful Sound departure point moments walk from Manapouri Lodge.